Superego, Other Guitar Effect from Electro-Harmonix. 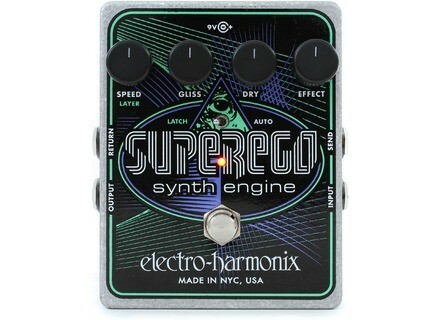 Electro-Harmonix's Superego has been released. 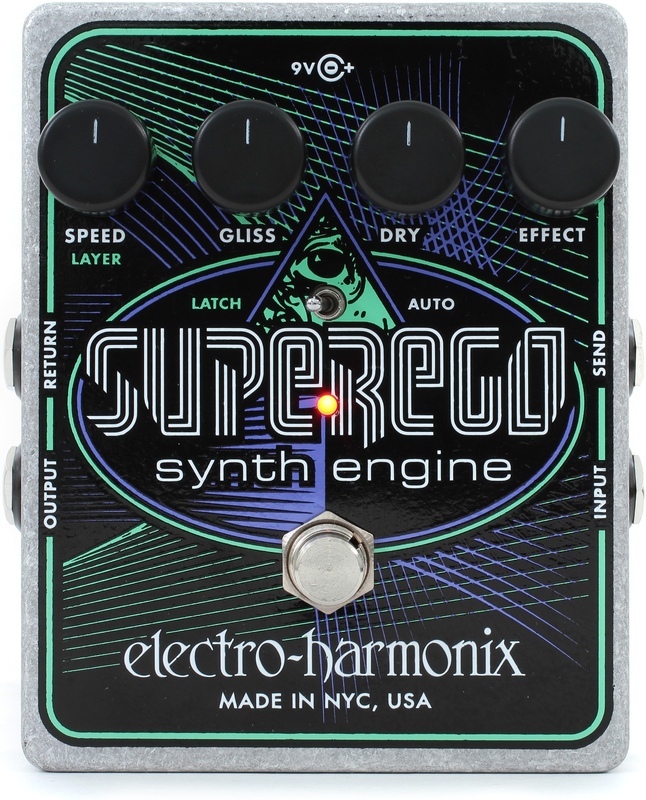 EHX’s new Superego Synth Engine is designed to capture and hold notes or chords, perform glissandos and create oscillator like synthesizer effects. It is designed to enable the player to stack or layer sounds, create infinite sustain, or tweak attack and decay. The Superego’s effects loop also lets a musician insert effects into the wet signal. The SuperEgo has a simple control layout. The Speed control adjusts the attack and decay rate. It doubles as a level control for layers in Latch mode. The Gliss knob adjusts the glissando or glide speed between notes and chords. The Dry and Effect knobs are level controls. The pedal also features three modes controlled by a mini toggle switch: Auto, Momentary and Latch. In Auto mode, the Superego captures and freezes a note or chord and holds it until the next note or chord is played. In Momentary mode, a note or chord is captured as the footswitch is depressed and released when it is released. Latch mode enables the player to layer or stack sounds. The new Superego Synth Engine pedal, set for a Mid-May release, is housed in a die-cast package, is equipped with a standard 9.6-Volt/DC200mA AC adapter and carries a U.S. list price of $283.60. Check out EHX for more details. Win a Soul Drive Tube FX Pedal Lightning Boy Audio is giving away a Soul Drive tube Pedal. Like them on Facebook to enter the draw. Reverend Gil Parris Signature Transparent Red Reverend Guitars is offering the Gil Parris Signature model in Transparent Red for a limited time.